Troubleshooting hot water heaters is needed when you start having trouble with your water heater. There are numerous problems that you may be having. Usually the one that gets your attention is No Hot Water or Not Enough Hot Water. When this happens, cool or cold showers start to be a real problem. What can you do? Is this something you can take care of? This depends largely on the problem you are having. To make things more complicated there are different types of hot water heaters. In homes that have natural gas you will likely have a gas hot water tank. Gas water heaters heat the water by burning natural or LP gas. Burner issues, pilot light issues and the famous thermocouple are among the things you might be faced with. Electric hot water heaters use electricity to heat the water. A heavy duty electrical circuit is installed for this purpose. Heating elements and thermostats are the leading causes of problems. How much can you save? That is a question that has a broad answer. A service call may start out at $100. Being sold a new hot water heater could run as high as $3,500 for a top of the line high efficiency model. Most parts for a hot water heater are less than $25. For an electric water heater checking the breaker would be the place to start. The thermostats also have reset buttons on them. A gas hot water heater needs to have the pilot light checked. Has it gone out for some reason. Electric water heaters have strong current that heats the water. Make sure the power is off before even attempting a test. Gas hot water heaters use natural or LP gas and gas can explode. Make sure the gas is off before you take anything apart. Both types have very hot water in them and burns or scalding are possible. Being without a hot water heater is a serious inconvenience. Your family will likely be unhappy. Troubleshooting water heaters has to split into two categories at this point. In order to solve your water heater problem you need to veer off into one of two directions. You either have an electric water heater or a gas one. The problems and things to look for are different. There is some general information about each type. In addition there is a link to the troubleshooting articles for each type. Are you looking for some information on tankless water heaters? Try Plumbing Help - Tankless Water Heaters for some information on this type of unit. Gas hot water heaters are an ecomomical way to heat water. However, they use a combustible fuel and have safety features built into them to prevent explosions. With that said, it sometimes these safety features that prevent the unit from working. Troubleshooting water heaters that use natural gas will often focus on the gas valve and burner assembly. This article uses descriptive language to help you to narrow down your problem. The water heater gas valve is able to interpret this electrical current and tell whether or not the pilot light is lit. A defective thermocouple will not send the proper signal. The gas valve will not allow gas to go to he pilot light or burner if it does not get the right signal. The thermocouple is not the only problem you can have. However it is often the culprit when the pilot light or the burner will not stay lit. The above link takes you to an article that discusses majority of possible problems you could have with your gas water heater. An electric water heater normally uses a 230 volt 30 amp circuit to operate. This is some serious electricity. Extra care an caution needs to be exercised when working on this type of unit. If you uncomfortable around electricity or unwilling to take precautions, it may be better to call a professional. Willing to be careful? Then you probably can fix it. For electric heater, water heater troubleshooting involves dealing with electrical devices. An important one is the heating element. These can burn out over time. A burned out element can cause you to have 'no hot water' or 'very little hot water'. Elements can be changed but there is some work involved. Another trouble maker is the thermostats. Unlike a gas water heater and electric one has two. The upper thermostat controls the lower one. So any issues with the upper thermostat or element and you will have 'no hot water'. Testing is involved in troubleshooting water heaters that are electric. Don't be afraid, the tests are pretty simple. Of course there are other problems with electric water heaters. The above link takes you to an article that discusses all of them. Follow the link to get the information you need. Sediment can build up in the bottom of your hot water tank over time. This affects the amount of hot water that the tank can produce. In addition, it can cause damage to other parts of the water heater. This is especially true of electric water heaters. The lower elements of electric hot water heaters can burn out due to sediment. There are steps you can take to remove the sediment. Learn what they are by following this link. Sediment build up in a hot water tank is a bad thing at several levels. First, it reduces the amount of available hot water. If you have twenty percent of your tank filled with sediment, you will have twenty percent less hot water to use. A related problem is that, you will have to pay to keep the sediment hot. This is a waste of energy and money. Electric water heaters can be further damaged by sediment build up. Heating elements can be damaged from sediment build up. This will cause the lower heating element to fail, dramatically reducing the amount of hot water the tank can produce. Regular flushing of the tank can prevent or eliminate problems. This is the process that will remove the sediment inside your hot water tank. It is a bit of work and you will need to take precautions to keep from making too much of a mess. A garden hose and a pair of pliers is all you need. Click on the link above to get to the information. How serious is it when a hot water heater is leaking? That depends a lot on where it is leaking and how much. Some things can be tightened to stop the leaks. When the tank itself starts to leak, it means that the water heater needs to be replaced. Find out if you need to look through your papers for the warranty. See if this is something you can fix. Click this link to get the good or not so good news. What's a dip tube anyway? Believe it or not, it is an important feature of your hot water tank. Find out what can go wrong with this part and what you need to do to fix it. Just take my word for it, it is important. 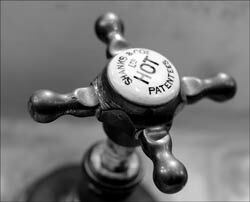 The amount of hot water you have will be affected by it, when it is broken. Follow this link for information. A pressure and temperature relief valve is a safety feature on a water heater. When pressure builds up, to an unsafe level, inside your hot water tank, this valve releases. A defective valve will release when the pressure is still within safe limits. How to you know when it is bad? How hard is it to fix? Click on the link above to find answers to these questions. Can you replace this valve if you need to? How hard is it? More questions that this article answers. Water heaters are an important feature in your home. They are sorely missed when the don't work. Finding and solving the problem quickly is important. The links above should have pointed you in the proper direction. Hopefully you will be able to track down your problem and fix it. After your troubleshooting water heaters project is complete you may decide to call a professional. Knowing what the problem is, will save you money when you talk to them. When you understand the problem you will not be sold on things you don't need.